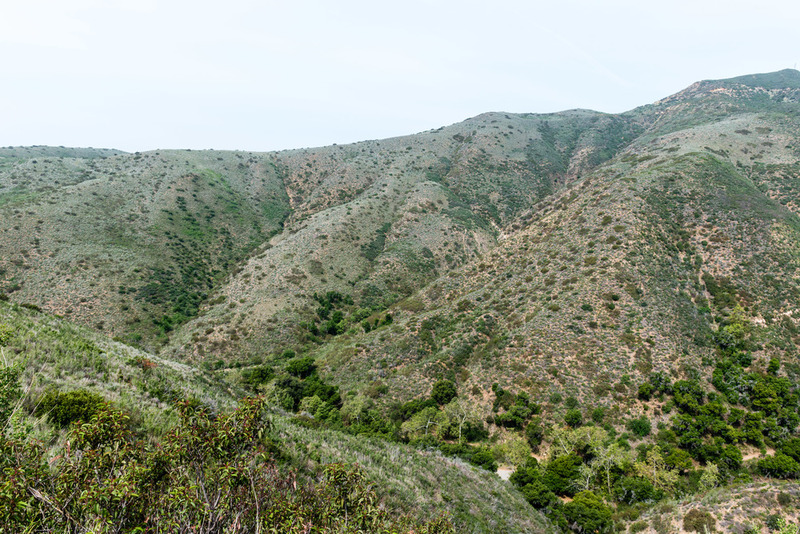 For my first hike in Malibu I chose Solstice Canyon. When looking for trails this one got me due to there being a little water fall at the end of the hike. There are a couple of loops to take to the final destination, an old burned down home, and we chose the more difficult of the two - Rising Sun Trail. I wouldn't call it strenuous at all though, it's a good hike but nothing you can't handle. For instance, I passed a couple coming back down Rising Sun and the father was carrying his child on his back in one of those baby slings, so can't be too tough. The views are great but you don't really get any sight-lines to the Pacific Ocean. Along the way, on Rising Sun, you pass evidence of past fires, burned trees and the ruined home. Once you get to the end, you know you're close when you hear running water, you'll find the ruined home area. The waterfall was really small, but I guess it varies based on season and we are in a serious drought. I didn't take many pics there but I did add my name to the fireplace area, what I assumed was the living room. Overall a great hike, there was a cool breeze the entire time so wasn't too hot and the drive there along the PCH isn't that bad either.